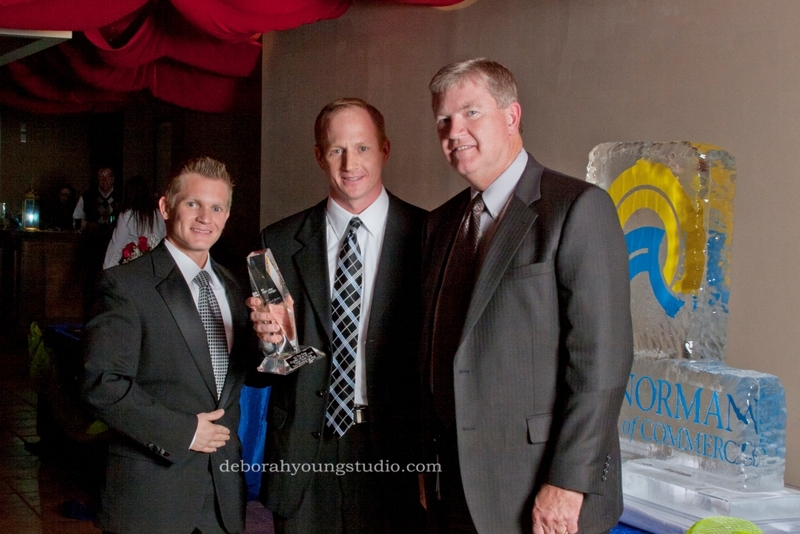 John Bradford, owner of Park Avenue Properties, LLC in Cornelius, has been selected the 2011 Robert T. Cashion Business Person of the Year by the Lake Norman Chamber of Commerce. The announcement was made at the Chamber’s Annual Meeting held Thursday, January 19th at the Havana Banquet and Ballroom. 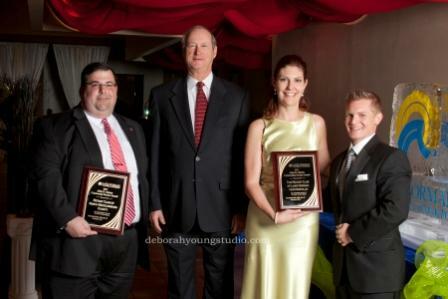 The award was presented by 2011 Chamber Chairman of the Board Robert Reed and Bobby Cashion, representing his father Robert, for whom the prestigious award is named. 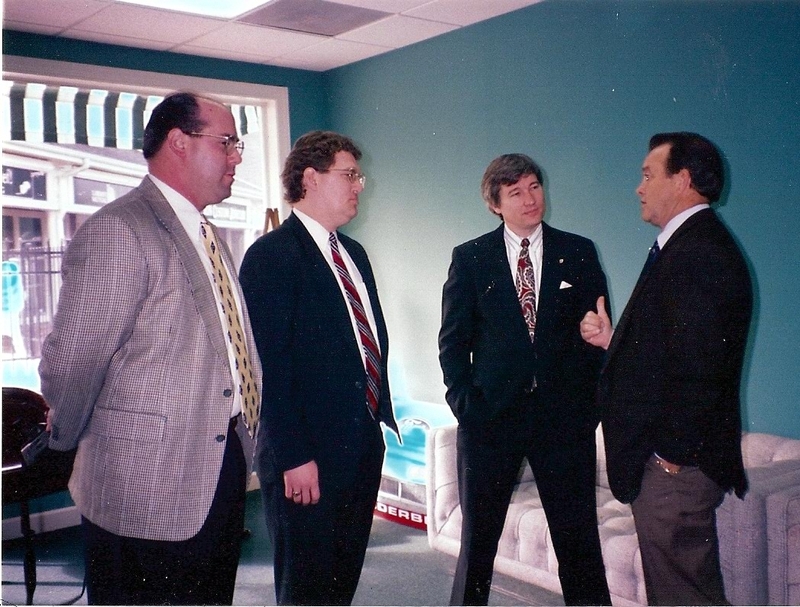 Bradford started Park Avenue Properties as a side business while working full-time as a Sales Executive with IBM. The firm continued to grow which led to Bradford eventually leaving IBM to continue working toward his dream of owning a successful Property Management and Real Estate firm. The agency has grown from 60 properties managed in 2007 to over 1,000 properties managed by the end of 2011. Park Avenue increased its property management and real estate business by 50% in 2011 and expanded their property management business into three additional regions:Raleigh,Myrtle Beach, and Memphis. In 2012, the firm’s expansion plans include Charleston, Columbia and Greenville, S C.
In addition, Park Avenue Properties was ranked #7 in both 2009 and 2010 by the Charlotte Business Journal among Real Estate Firms for the total number of transactions closed. A community minded firm, Park Avenue Properties held its second annual Haunted House in conjunction with Latta Equestrian Center to benefit local charities. Attendance nearly doubled from its inaugural year with approximately 4,000 people in attendance. All the event’s profits were donated back to the community in various ways such as Habitat for Humanity and Pi Kappa Phi’s Scholarship Foundation. Bradford is a Cub Scout Den Leader, served as a PARC Commissioner and was elected in November as a Cornelius Town Commissioner. He serves on the Lake Norman Chamber of Commerce Board of Directors and is highly involved in his industry serving as the Southeast Regional Vice President for the National Association of Property Managers in his second term.Bradfordhas served as Vice President and President of the local Chapter. 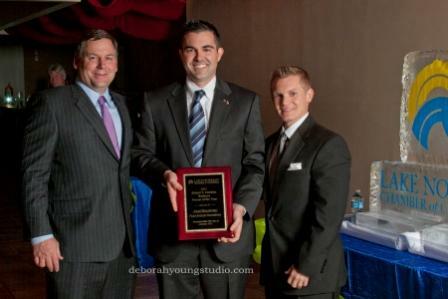 Matthew Hayes, principal at North Mecklenburg High School, was presented the Duke Energy Citizenship and Service Award by the Lake Norman Chamber of Commerce at the Chamber’s Annual Meeting held at the Havana Banquet & Ballroom in Cornelius. Hayes was nominated for the recognition by Charlotte Mecklenburg School Board Member Rhonda Lennon and recommended by Huntersville Mayor Jill Swain. Lennon cited that Principal Hayes has engaged the North Mecklenburg High School community partnering with stakeholders in school improvement. The stakeholders included the parents, community members, boosters, business community, and elected officials. He has organized the teachers into teams and created monitoring systems for students with a mastery binder to customize learning for students. Principal Hayes has instilled “values” and encouraged students and teachers to honor the traditions and beliefs that make North Mecklenburg special with clubs, pep-rallies, grade level functions and extra-curricular activities, while reinvigorating the academic program with a focus on achievement. In accepting the award from 2011 Chamber Chairman Robert Reed and Tim Gause, Director of Government and Community Relations for Duke Energy, Hayes spoke of the strong commitment of his support staff including Lennon, Interim Superintendent Hugh Hattabaugh, district personnel, and the teachers who work directly with the students. Principal Hayes, in his remarks, encouraged the business community to get engaged. He cited the critical role businesses can play in mentoring students as they make their plans in post-secondary education and prepare to enter the workforce. Matt Hayes started in CMS as a teacher in the Afterschool Enrichment Program and taught sixth grade at Carmel Middle School from 1996-2002. He also coached football and baseball there before becoming Assistant Principal at Quail Hollow Middle School from 2002-2006 and Principal of the School of International Studies and Global Economic at Olympic High School from 2006-2010. He was named principal of North Mecklenburg High in 2010. This year marks the 25th anniversary of the Lake Norman Chamber which was formed in 1987 as the North Mecklenburg Chamber of Commerce. It also is my 16th year at the Chamber. I shared that the other day with a member who stated I must have seen quite a bit of change in the region over that course of time. That’s perhaps putting it subtly. The first week I was here in January of 1996, I asked then Chamber Chairman Scott Lawrence for a list of a dozen or so people I needed to meet immediately. While the list was substantial and a “Who’s Who” of influential elected and business leaders – at the top was the name John Cherry. A couple of weeks ago, I called John and reminded him of our meeting 16 years ago and asked if he thought we had made the impact those founders were looking to obtain. Cherry stated the goal then was to get “Our fair share.” John reminded me that in 1987, North Mecklenburg just around 4% of the county population and had virtually no representation on issues. “Gary Knox was really our spokesman – a real hero for the region – as we all set out to get a District 1 County Commissioner and School Board representative.” For Cherry and the early leaders, it was about getting the things that make a community: quality restaurants, shopping centers, a hospital, parks, quality private as well as public schools. “Getting our own office supply store so you didn’t have to rely on Charlotte,” John continued. Cherry pointed out the early business leaders pushed for a unified North Mecklenburg including getting the three towns to work together. “There is real strength in numbers and we could accomplish so much more together,” he added. Few people recall it was the Chamber that began encouraging the three North Meck, and later Mooresville joining in, on a three town quarterly dinner meeting to share ideas and goals in common. The Chamber coordinated the first of those meetings which have continued today. The Chamber encouraged the towns of Cornelius, Davidson, and Huntersville to join the Chamber in forming a regional travel and tourism authority – today known as Visit Lake Norman and in 2003 lobbied again to create a public-private regional economic development authority – our present day EDC. “The Chamber of Commerce is much more than an opportunity to socialize and network at events like the Business AfterHours. It helps tell our story to other regional business and elected officials so we achieve our objectives,” Cherry reminded me pointing to the recent success of getting I-485 expedited, discussion of the Red Line, and I-77 improvements. Cherry and those early elected and business leaders had a vision of what we could achieve by working together as a region. Today that region includes South Iredell and North Mecklenburg. It is the Lake Norman region and Cherry’s Chamber continues to tell the story. It is the story of “Commitment.” A commitment that transforms visions and promises into reality. It is the power and energy to change the face of things and for 25 years, the daily triumph of integrity over skepticism.